Anyone who has followed Gregory Porter knows the impact that his mother and the legendary singer and pianist Nat King Cole had on his life and career. It was Porter’s mother who told six-year old Gregory that he sounded like Cole after the kindergartener sang for her an original composition. Porter’s mother’s dying wish was for a son to pursue music after a shoulder injury ended his college football career at San Diego State. We learn on the DVD of One Night Only: Live at the Royal Albert Hall, the live audio and video recording of one of three concerts featuring the songs from Porter’s 2017 album Nat King Cole and Me, along with original tunes from his earlier albums, that Porter knew that that was one of those things that mamas say to encourage their babies to keep on keeping on. Although Porter learned that he sounded nothing like Cole, his mother’s words sparked her son to learn more about the legendary crooner. The lessons Porter drew from tunes such as “Pick Yourself Up,” “Smile” and “Nature Boy” the singer who died in 1965 became a father figure to a boy and young man raised in a single parent home. The beauty of the DVD is hearing Porter, an artist who possesses a personable and calming stage presence and an old-school vibe, introduce songs to his audience or make comments at the end of them. This gives viewers insight into his personality. For example, at the end of the Spanish language tune “Quizas, Quizas, Quizas,” – a tune he introduced as “A little Cole in Espanol” - Porter explains that his Spanish teacher was in the audience during a concert in California. “She was like, ‘very well, you did Ok,’ he said as the audience laughed. In addition to allowing the viewer to hear the music, a concert DVD has to get as close as possible to giving the viewer the full concert experience. The CD simply gives listeners the music, which on both platforms is excellent. Porter’s sidemen work in concert with the 70 -piece London Studio Orchestra while also standing out and being distinct. The album features several standout vocal performances by Porter. I thought that one of the high points on Nat King Cole and Me was Porter’s rendition of “But Beautiful,” but the with the orchestra behind him and a like audience in front of him, Porter is even more energized and his vocal soars. Porter and pianist Chip Crawford take the audience to the sanctified church of Porter’s youth with a bit of improvisation and call and response at the conclusion of “No Love Dying,” and strings that open “The Lonely One” endow the number with a theatric and melancholy swing that Porter more than matches with his vocal. 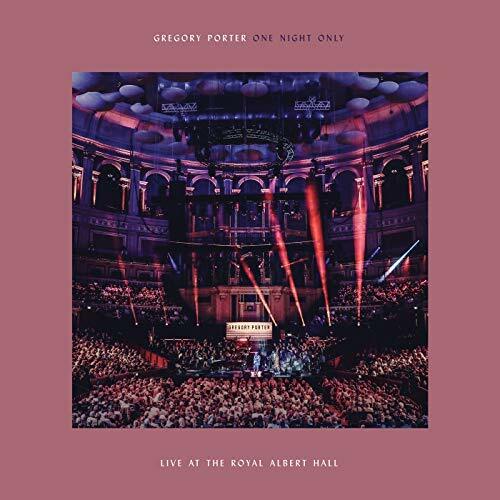 One Night Only: Live at the Royal Albert Hall is Porter’s first domestically released live album. Both the CD and DVD will give those of us who have never seen Porter live a glimpse into what those fortunate enough to attend a concert already know: Gregory Porter is a peerless performer. Highly Recommended.